Wonder Foods Organic Stevia is convenient natural herb extract available in powder or drops. Use it to replace sugar to sweeten foods and drinks, as well as in baking. 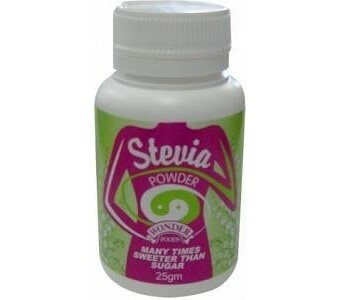 Wonder Foods's Stevia is extracted without the use of solvents or alcohols ensuring its pleasant taste. Many times sweeter than sugar, Stevia is an economical and guilt-free alternative. Wonder Foods Organic Stevia contains added chromium to help assist pancreatic function, and could minimise sweet cravings. All natural Organic ingredients Vegan No artificial colours No artificial flavours No artificial sweeteners Ingredients: Stevia rebaudiana extract equiv. to dry leaf 510mg Chromium (as chloride) 8.2mcg Store below 30c.